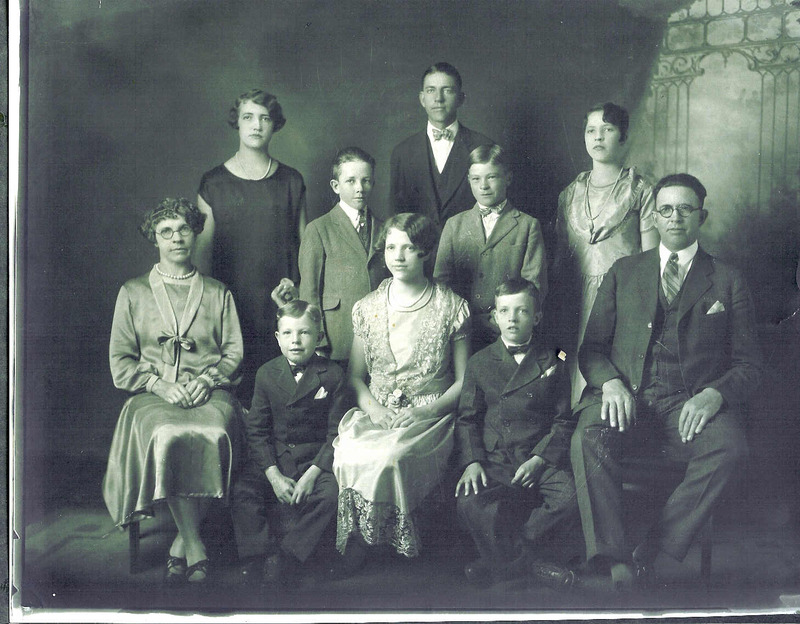 Seated: Mary Ann Price Stucki, Smith Price Stucki (they called him Price), Mabel, Glenn Price Stucki, Joseph Smith Stucki. Daughter Madge and son Owen Price had already passed away. Note: Grandmother (Mary Ann Price) Stucki made all the dresses that the girls were wearing and all the suits except those worn by Grandfather (Joseph Smith) Stucki and Wendell. The dresses that Pearl and Mabel were wearing were their prom dresses. The picture was taken in Montpelier in 1925, just before Wendell went on his mission to Switzerland. Evelyn was teaching school at Eight Mile (Idaho) and came home for this occasion. Before the photograph was taken, Pearl had been laughing. As the shutter opened, Wendell was pinching Pearl's fingers to get her to look more serious. It looks like it worked.